Former champions Rafael Nadal and Novak Djokovic will appear at The Boodles exo event in London this week. The exo runs Tuesday through Saturday on Stoke Park’s grass courts. Both players enter the event off losses in their most recent matches. Nadal lost first round last week in Queen’s to Alexandr Dolgopolov while Djokovic hasn’t played this grass season since his French Open final. Also playing are Milos Raonic, Richard Gasquet, John Isner, Jack Sock, Thanasi Kokkinakis and Alexander Zverev. Is Novak Djokovic’s Right Wrist Bothering Him Again? awesome that we have a nummber 1 promoting Atptournees. how many million is he hoarding in a year? and still wondering why the tournement directors are rather dealing with Federer then some fake wannebe goath. It’s good that Nadal is “Boodling” too – when he lost at Queen’s I thought it offered an opportunity for him to play freely without the pressure of another ATP tournament. As well as Novak and others mentioned, Berdych and a couple of others had planned to be there also. Don’t think it is solely about money – it will help to find form for Wimb. Yes? No? Why are you guys always so judgmental? What they play & what they skip is their choice…you have nothing to do with it. If it was illegal they wouldn’t do it. Why do you think your opinion should matter…cause guess what…it doesn’t! In Rafa’s case…..He is in desperate need of more match practice on grass before Wimbs, be it an exho or whatever! I don’t think he or Novak either one need the money, but Rafa needs more time on grass and Novak probably could use a tune-up too, since he’s been off since the Frenchie! novak has played the boodles every year since 2011 so this is his 5th year. obviously he likes it there. agree with okie; i don’t think it’s about the money for these top players. it’s a good tune up site. lots of players play an exo before the australian open too. Annie – I don’t think players should be required to play any tournaments ever…but it is hard to accept their claims that the season is too long and there are too many tournaments when they play exhibitions where this is still a risk of accumulating fatigue and or injuries. The risk is lower, so it’s a good way to get some matches in without the same level of effort and risk of tournaments, but it doesn’t make the argument that the ATP schedule is too long and congested hard to swallow. au open is hardly comparable. Why would you point to Australië open? how many tune up events are there for Au open. so also it is start of the year players need playtime. to skip 3 weeks of atp event which are taken place in same part of europe is insulting to atp tournements and Atp itself. especially for #1 ranked player. is he ever going to give something or does he keep taking and taking. This boso is starting to p.ss me off. His parents are sure living up to what they are projecting over the years. MMT – the problem is one of compression. Meaning that there are long stretches off where exos make sense. And it is not just the money. In Nov 2013 Rafa and Djokovic just had a wonderful time with Chilean and Argentinian hosts – with one another, and Gomez, and Nalbandian. And compression references periods like Euro Clay season where players can face 5 tournaments in 2 months and something has to give in the schedule, unless you are a younger Rafa. And Nole has skipped the ATP events after the French since 2011 for a reason…he needs to step away and lick his wounds after 5 straight years of getting bit each time. Get his head on right for Wimbledon. And Boodles is a fine venue for players to do last minute tune up, play hard, but also have fun. Make money. And if you are Fed, or Rafa, or Nole’s wife…prime chance to work potential donors to their Foundations. Nice stats Jane, if Novak wins this year he will jump to 52-8 for a 86,7 %, fifth all time. 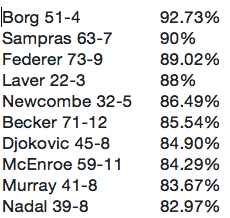 Murray also will jump if he wins going to 48-8 85,7 % placing him on seventh, depending how well Djoko does. If Fed wins he gets closer to 90% club but he would have to win this year and next tear to reach 90% and doesn’t play it ever again to no lose. Very unlikelly. He will finish with above 87% and most likelly record of Matches won at Wimbledon. An 8 title there would be fitting bit I guess Djoko and Murray will not allow it this year. Very curious to see the draw. A good deaw for Djoko would be Fed and Murray in one side and Wawa on his semis. Wawa is jot guarantee to reach that far and even so, Djoko has a better chance to avenge RG final here on grass. This way he could only have to beat either Fed or Murray for a title, but if he gets Murray on his semis it will be abother tougj tourney for him. Because thai time Murray will leave all he has on court for a win. “how many tune up events are there for Au open” – actually there are about as many as there are for wimbledon. for example chennai, brisbane, doha, etc. for wimbledon there are queens, halle, stuttgart, and maybe one or two more. very similar. yes, it’s the beginning of the year, but grass season is so short it’s an anomaly, almost like its own little “season.” anyhow. daniel, i agree that the draw at wimbledon will be very important this year, just as it was at the french. i wouldnt under-estimate rafa and where he lands, either. after all, dolgo can do that to a player, especially over 3 sets. but over 5, it’s likely rafa would’ve won that match. so i still consider rafa a big threat in the draw. stan, it’s hard to say. but he has played both roger and andy very closely at wimbledon over the years. he’s such a streaky player, a bit up and down, so it’s tough to know what to expect. Interesting stat, Jane. Part of it is of course that Nole had 5 wins over top 10 players in finals. But if you subtract his 5 and Andy’s one final win and Feds 2, you still end up with Djokovic, so far this season, having the toughest draws. Okiegal-good attitude!You can only laugh….Those posters p***off and I respond sometimes but then I think like you-is better to laugh then waste time with those posters. By the way-here, in South West France, proper countryside with no many people, I meet last week guy asking for directions-and he was American and he was from Oklahoma! I thougth about you…I have to say,you guys have funny accent. courbon, I can barely understand an accent from Alabama, Mississippi, Louisiana, Georgia, North and South Carolina, Tennessee…ect. any accent considered “deep” Southern. East Texans can also be tough. Calling Direct TV or some other service, many times I get someone from the deep South and basically may as well hang up and call back for someone speaking a different accent or we end up saying what? what? what? a lot…they don’t understand me, nor I them. It’s over a year away. Rafa will still be playing – will have likely won the FO la Decima. Posters writing him off are nuts. Rafa isn’t going anywhere. Boodles is a tournament Nole has played for years, as Jane says. Many of the players use it as a tune-up. I don’t see what the issue is. If a player went deep, won or lost the FO, and had a lot of matches going the distance during spring hard court and clay season, they have more than fulfilled their responsibilities. I’d say injury risk is less at Boodles – they don’t have any pressure to overexert themselves and no points are at stake. Add to the list of pre- AO tune up tourny’s Sydney and Aukland. The men’s qualifying started today at Wimbledon. Tomorrow will be more men and women qualifying. Seems they are starting the qualifying a bit early? maybe I’m forgetting. Anyway noticed looking at scores, teenager Andrey Rublev won his 1st round and will face Ivan Dodig next. Ryan Harrison’s match was interrupted by rain as were quite a lot of others. @Courbon….Oh, how I wish you would had asked him what city he hailed from. Your normal Oklahoman doesn’t mind answering question about our great state. A lot of people from other states, far removed from Oklahoma boundaries are so curious about Oklahoma. I talked to a telephone operator from New York and she was under the impression that our Indian tribes were still uncivilized and having uprisings. Where these rumors come from I’ll never know!! Yes, everyone outside of Oklahoma think we have a funny accent. Texans and Okies sound a lot alike. I’m glad you mentioned France. I was watching a documentary the other night about the US 29th infantry storming Omaha Beach in Normandy, France during WWII. The cemetery and the county side was absolutely beautiful!! Wondering…… have you ever been there??? When the documentary was about France, I immediately thought of you!! Missing the point again. You can only enter 1 tournament a week. The exo in December is a great way for players to get some game time. There really is 1 week of tournament to prepare. You don’t want to play week prior slam unless your name is wawrinka. The 2weeks we had on grass with esp. Last week 500 is set perfect. djokovic is a lousy #1 not to play 1 of them. The interesting about that stat would know win/loss versus top 10. We know Djoko is 16-2 as he only lost this season to Fed and Wawa as top 10.
thanks jalep, for backing up my points. i see kyrigos has parted ways with his coach. I think we can all agree that the grass season is short enough as to not exhaust anyone. The random exo just gives the players a touch more flexibility for their schedules. Will Jack Sock’s forehand work on grass? I wonder who Rafa bumped from Boodles? And that the Clay season is tooooo long that exhausts everyone, fan watchers included. After my investigation, I found an early list that Rafa wasn’t on and the new roster has Rafa on it along with the original roster. I didn’t see Will Ferrell on the first one, so it appears Rafa didn’t bump anyone. They’re starting the matches earlier than usual, extra matches, probably because they made a place for Rafa……..according to the article…..
Okeigal: No I did not ask where they are from.I was just suprised to see Americans, this is not very touristic region.Countryside is stuning here and that is the reason I moved from London here ( and because I prefer my little kids to grow up here then big city ). You bought the boat?? Well, according to some people, end of the world is near-so start collecting animals and get ready for the flood! @Courbon…..Yes I bought a boat! But if the end of the earth is near, a boat won’t do me any good. According to scripture the earth will be destroyed by fire….. Maybe I should buy a very large fire extinguisher!! You didn’t answer the last part of my question about Omaha Beach…..just curious if you had been there. Since you live in southern France, that would be a long way from Normandy?? That is northern France?? It was a beautiful area of France….but I’m sure there are many gorgeous places. We have some lovely places in the USA that I will never get to see…..sigh….. Thanks for the reply, I appreciate it very much! Thanks so much for your thorough investigation – looking for more results but would be shocked to see Sock dispatch the more nimble Kohls on the grass.. I never been to USA and that is one thing I have to do ( before I die ). Probably without family , with the friend, rent a car and do the road trip-East-West coast-It is a cliche but I do not care! Keep the boat, buy fire extinguisher and you should be covered for any ending. I’m glad you appreciated my research! I’m looking forward to the green green grass of Roger’s home! I have a sneaky suspicion he is going to do well there this year…..I hope my guy fairs better than last year!! @courbon…..I do hope you do come to the states at some point in time! We have some beautiful places too. We have a desert in NW Oklahoma and it’s called Little Sahara. It’s the strangest sight….out in the middle of nowhere, there’s a desert! Regarding Europe….I think I would want to go to Paris 1st and Switzerland 2nd! I’m curious about those two places. Don’t fly, so that’s out! I will have to be satisfied with the USA and her sights! Thanx for the reply. Hope Wimby is a cracker this year! !